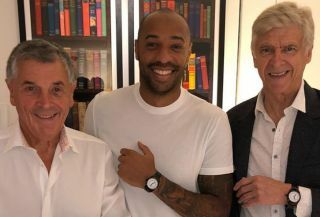 Arsenal fans are getting nostalgic for the good old days this evening as legendary duo Thierry Henry and Arsene Wenger reunite on Instagram. The pair, standing alongside former Gunners chairman David Dein have been modelling some new merchandise in this photo below. The Arsenal legends’ Rolexes are to commemorate the club’s famous Invincibles season of 2003/04, so it’s little wonder to see the comments section full of nostalgic Gooners. Little has been seen of Wenger since he stepped down as Arsenal manager back in May to be replaced by Unai Emery, bringing to an end 22 years in charge in north London. ‘We miss you Arsene!’ read one comment, while another described the photo as one ‘every Gooner dreams of’.